Falkirk's first fully licensed and inspected premises offering the latest techniques in permanent brow, eye-liner and lip enhancements. We also offer a range of advanced facial treatments including, non surgical face lift, micro dermabrasion, radio frequency skin firming, and electrolysis. 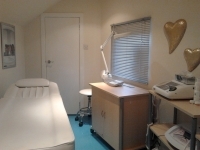 We also have specialist visitors offering Botox, fillers and non peroxide teeth whitening. I have over 21 years experience and I am qualified in over 30 different areas of beauty to HND level and have continued to add to my training over the years. We offer demonstration evenings to small groups of no more than 8 ladies. please call 01324 552486 if you would like to organise an event. Ticket proceeds are donated to cash for kids.